Files related to Patrick Kennelly's May 2007 article are available. Earth System Science: A Model for Teaching Science as State, Process and Understanding? An overview of the events and activities leading to the NASA/USRA sponsored Earth System Science Education (ESSE) Program initiated in 1991 with continuation through 2006 as ESSE 21 is presented. The overview includes the rationale for seeking support from NASA for the initiation of interdisciplinary courses and collaborative efforts in the creation and sharing of interdisciplinary educational resources within the ESSE Program. The immediate motivation in 1991 for initiating the ESSE Program stemmed from the vision expressed by NASA's Earth System Sciences Committee in its presentation document, "Earth System Science, A Closer View," which is turn was part of the Nation's 1980's focus on Global Change. Several key events and capabilities that emerged during the last century which led to and enabled the focus on Global Change nationally and internationally are summarized. Besides society's concern over the environment, for the first time satellites and computers in combination with communications provided humankind with the capability to observe the state of the system globally, regionally, and locally. A key theme of this overview in conjunction with ESSE's Overview Schematic is to emphasize three inseparable elements in the presentation and learning of science in the classroom: state, process and understanding. The classroom is where ideally the student encounters the open ended nature of the multi-interdisciplinary framework of ESS and in turn learns to appreciate the interplay of disciplines involved including the importance of all in societal decision making leading to action. Colleges and universities across the U.S. are offering online Earth system science courses for K-12 teachers through NASA's ESSEA program. The three available courses-for teachers of grades K-4, 5-8, and 9-12-are delivered online and feature student-centered, knowledge-building virtual communities. The courses were developed for NASA within the Center for Educational Technologies (CET) at Wheeling Jesuit University. The Institute for Global Environmental Strategies (IGES) and CET managed ESSEA through NASA funding. Twenty participating colleges, universities, and education organizations were competitively selected to receive funding and training for running the courses and continuing support from IGES and CET. From 2000-2006, 1,707 teachers from across the U.S. completed a semester or quarter long ESSEA course from one of the participating institutions. Pre- and post-course surveys, follow-up surveys, and case studies with course participants show that the courses have had a significant impact on teachers' content knowledge, attitudes and practices. ESSEA has also shown that the courses are capable of being sustained beyond the original NASA funding. Seventeen of the participating schools report that they will continue offering the courses and many have developed new programs that incorporate the courses or foster continued Earth system science education opportunities for teachers. In order to effectively make Earth science data accessible, usable, and useful by the educational community it is clear that there needs to be a spectrum of services and resources that address the obstacles and support the efforts starting from the research scientist and ending with the student. We describe resources and services here that address a number of components of this spectrum. The Earth Exploration Toolbook (EET, http://serc.carleton.edu/eet) is an online resource that contains chapters, each of which provides step-by-step instructions to walk users through an example of using data and tools in a way that is relevant and interesting to the teachers and students. We developed a mechanism to support the development of new EET chapters, offering scientists an effective mechanism to provide their data, analysis tools, and scientific knowledge to the educational community. In addition, we piloted a professional development workshop series to facilitate the use of EET chapters by teachers. We have found that providing scientists with a partnership and mechanisms that help them facilitate the use of their data, analysis tools, and scientific knowledge by the educational community is very effective, and that providing professional development for the use of EET chapters is very important for facilitating the use of scientific data and analysis tools in education. The new undergraduate major in Earth Systems, Environment, and Society (ESES) at the University of Illinois at Urbana-Champaign is designed to offer an innovative, multidisciplinary liberal arts and sciences education in the scientific and human dimensions of the Earth system that transcends traditional disciplinary boundaries to explore the complexities and interconnectedness of society and the physical environment. The fundamental motivation behind the ESES major is the recognition that the Earth is a complex system in which the solid planet, the oceans, the atmosphere, and life (both human and non-human) interact in countless ways. To respond adequately to the environmental challenges of our time, it is necessary to understand these interactions and interdependencies that transcend traditional disciplinary classifications. The curriculum within ESES balances a broad exposure to diverse disciplines at an introductory level with a more focused substantive course of study at the upper level. Bringing together diverse perspectives from the sciences, social sciences, and humanities, this program allows students to study important and exciting interdisciplinary Earth system topics, such as climate change, societal development with limited resources, human impacts on the environment, deforestation, land use change, and issues pertaining to water use and availability. It is rare that an interdisciplinary group of educators has the opportunity to design a science curriculum without the constraints of pre-existing academic departments. In 1994, California State University Monterey Bay (CSUMB) acquired 1,387 acres from the U.S. Department of the Army and began construction of a new campus. CSUMB was developed as a four-year undergraduate university distinctive in its mission to serve the diverse people of California. Inspired by the Earth System Science Education program initiated by NASA and the Universities Space Research Association, CSUMB embarked upon the development of an interdisciplinary Earth systems curriculum that placed a strong emphasis on experience-based learning; integration of science, technology, and policy; outreach to minority students; and partnerships with the local community. Our cornerstone program is the Bachelor of Science in Earth Systems Science & Policy. It is built on a pyramid-style framework that includes integration, a systems approach, and applied technologies (base of the pyramid); a junior entry course, case studies, concentrations, service learning, student internships, and research experiences (middle of the pyramid); and senior capstone projects (apex of the pyramid). However, to succeed, new and innovative programs must constantly evaluate where they have been, where they are, and where they need to go to meet the needs of their students today and their students of the future. A team of faculty from the natural and social sciences supports an interdisciplinary curriculum and degree program in Global Change and Global Sustainability at the University of Michigan. We offer a series of lecture courses and laboratory sessions on Earth Systems Science and Sustainability entitled "Introduction to Global Change" (http://globalchange.umich.edu). We find that interdisciplinarity, inquiry-based learning and early capture of a student's interest create an attractive alternative to today's disciplinary undergraduate education, and has the potential to break new ground in structure, content and pedagogical methodology. With three lower-level courses at its core, we designed a 'front-loaded' interdisciplinary minor in Global Change. This minor reinterprets undergraduate education at Michigan, by providing an alternative model of general undergraduate education. First, the minor is "front-loaded," meaning that students are able and encouraged to complete most of their credit-hour requirements in their second (sophomore) year at the university. We find that an early interdisciplinary experience aids students in planning their subsequent university careers and their choice of a major. Second, the minor is grounded in the interdisciplinary study of critically important global problems that engage student interest, that are thematically integrated, and that are taught from a multi-disciplinary, inquiry-based perspective. Third, the courses are taught by a team of faculty from various schools and colleges who are experts in their respective disciplines, while sharing overlapping interests in education. Most K-8 teachers have undergraduate majors in fields other than science, yet many of them teach life, Earth, and physical science. For these in-service teachers, understanding the basic concepts of the K-8 science curriculum is a challenge. Here we report on a one-semester science course at Michigan State University that was developed to address the need of pre-service K-8 teachers to understand the basic concepts of life, Earth, and physical science. We use an Earth system science approach to explore the basic concepts of astronomy, meteorology, hydrology, and geology. This Earth system science approach is based on physical science concepts, namely, how matter changes and how energy flows in physical and chemical changes. An understanding of Earth system science is then used as a foundation for exploring the basic concepts of life science. A biome project is used to assess students' understanding of Earth system science. As humans continue to subject the global environment to greater levels of stress and demand, it is paramount that young children appreciate the significance and interdependent nature of the Earth system. We describe and explore the potential impact of one curriculum program, Earth Systems Connections (ESC), upon student learning and engagement. ESC aims to provide integrated learning opportunities for K-5 students across a diverse range of cultural backgrounds that will help them: 1) recognize the interconnected nature of the Earth's systems; 2) appreciate the technological tools (e.g. remote sensing imagery and analysis techniques) that scientists use to conduct Earth system science; 3) recognize the extent to which mathematics, science, and technology are not only connected to each other, but also can help to understand natural phenomena; and 4) cultivate a spirit of curiosity and confidence in themselves as emerging thinkers and scientists who will be responsible for setting research and policy priorities in the decades to come. Empirical evidence indicates that the use of satellite imagery and other rich pedagogical contexts within the ESC curriculum are effective means of elaborating mathematics and science topics for young children and their teachers. An Earth System Science (ESS) framework was used to integrate Earth, life and physical science topics in the development of a series of courses for in-service and pre-service middle school science teachers in South Carolina. The first of these courses was an integrated, thematic, standards- and inquiry-based course was pilot-tested with a group of practicing middle school science teachers and was found to be effective in terms of increasing knowledge of Earth System Science, influencing teachers to employ inquiry-based instructional strategies in their classrooms more often than before the start of the course, and influencing teachers to be more likely to employ authentic assessment strategies in their classrooms. These outcomes demonstrate that it is possible to employ modern pedagogical practices effectively in an ESS framework. The use of this course model could be implemented widely in both pre- and in-service science courses for Earth Science teachers. A major challenge--and responsibility--facing scientists is the effective communication of complex scientific information to lay audiences. While this issue is important regardless of scientific discipline, conveying accurate information about earth system science (ESS) is particularly critical because: 1) ESS lies at the heart of formulating environmental policy, 2) public interest is high with respect to many ESS topics (e.g. climate change), 3) ESS is inherently complex and uncertain, 4) ESS involves broad spatial and temporal scales not routinely dealt with by the lay public, and 5) media reports regarding key ESS topics are often brief and lack the depth necessary to appropriately convey the scientific debate and consensus on a topic. As part of an effort to improve the communication of ESS-related information to non-scientists, we required undergraduate science and engineering students to deliver ESS-related presentations to community groups. From 1998-2004, 46 students in 5 different ESS-related courses presented information to more than 20 different community groups in South Dakota and Colorado. Though quantitative pre/post assessments of the degree of audience education was not implemented, qualitative data indicate that incorporation of this project in our undergraduate ESS classes has helped to begin bridging the important gap of transferring current ESS understanding from the realm of the scientist to that of the general public. There is a recognized need by educators to increase interest in the sciences among underrepresented minority groups, and thus increase the number of minorities (including indigenous peoples) going into geoscience-related professions. For example, populations on Pacific islands are one of the most vulnerable to climate change; yet they often lack the "in-house" scientific expertise to monitor their local environments. We believe that the weaving of Western science ideals with traditional knowledge through a culturally appropriate curriculum can be a highly effective way to convey Earth system science topics to indigenous peoples, such as Native Hawaiians. We developed a curriculum which emphasized the integration of traditional knowledge, geospatial technologies, and Earth system science. The resulting summer institute course, Kaha Ki`i `Aina, was ranked highly by the Native Hawaiian students. Further integration of traditional knowledge with Western science in the curriculum should create a pathway to attract more indigenous peoples, like the Native Hawaiians, into the geosciences. Web-based inquiry educational modules using Geographic information system (GIS) maps are ideal for earth and environmental systems education. GIS maps display and manage a rich array of spatially referenced data, which can be combined in user- defined ways to study most natural systems. The maps can be served over the Web to create flexible and portable educational modules for science education. We describe the use of GIS maps for an ongoing pre-service teacher graduate education course at Lehigh University and show applicability to other traditional disciplinary courses taught in many secondary and introductory college classrooms. Like Earth system science, use of GIS maps transcends traditional natural and social science disciplinary boundaries. GIS can be used to track how natural systems are functioning and changing in response to human activities. Similar to Earth system science, GIS maps provide a framework for integration of environmental data across a range of temporal and spatial scales. Instructional use of GIS helps students integrate disciplinary perspectives to appreciate a broader, systems viewpoint. The implementation of Web-based GIS in conjunction with other content materials enables learners to analyze and synthesize large amounts data that would be much more difficult in other formats. The Carbon Cycle module provides a tool for interdisciplinary, team-based assessment of the causes and solutions to changes in carbon dioxide in the atmosphere, for use in high-school or introductory undergraduate courses in earth systems science or environmental science. A reduced-scale model (i.e. a model whose complexity is well below that of full scientific models, and yet reproduces the behavior of those more complex models) has been developed that allows students to systematically explore the relationship between a variety of biogeochemical processes, and their interactions with social processes, as these relate to the accumulation of carbon in the atmosphere. The module walks the students through the construction of the model, through exercises in which simulations are performed of changes in either environmental processes or society's use of energy, and through use of the model to identify effective policies for reduction of atmospheric carbon dioxide. Through use of such a module, students can understand the interactions between the disciplines that underlie earth systems and environmental science, develop needed mathematical skills too often lacking in introductory earth systems courses, and explore the role of scientific analysis in identifying and selecting environmental policies needed to reduce the accumulation of atmospheric carbon dioxide. Faculty members in earth sciences have the opportunity to engage students more fully in their local and global environments by working with them to develop and interpret a campus nitrogen budget. Through this experience, a campus environment is transformed into a conceptual framework for understanding the nitrogen cycle, specifically human impacts on the local nitrogen budget, and the effects of environmental management programs on the local nitrogen budget. This paper describes why and how to use the campus nitrogen budget as a class project. Through collaborative and individual projects in two upper level courses, undergraduate students established a new surface environmental observation station (Austin College Weather Station). In addition to standard meteorological observations, the Austin College Weather Station detects radiation and soil measurements. These additional measurements are used to calculate the local surface energy balance, an important indicator of local climate system interactions. The weather station projects provided excellent opportunities for students to participate actively in the scientific process. The first phase involved establishment of the weather station. In this semester-long collaborative project, students engaged in all aspects of scientific field research, including planning, testing, implementation, data collection, analysis, and evaluation. They became experts on two weather station instruments. The second phase involved calibration and validation of the Austin College Weather Station. These 7-week individual projects required student research proposals, research papers, and peer review. Student learning outcomes included both scientific content and scientific process. Many innovative assessment tools were utilized, including proposal writing, peer review, group meetings, research presentations, research papers, and a faculty review panel. These courses both received strong marks from students for promoting critical thinking and teaching effectiveness. Perhaps most importantly, students had fun participating in these research projects with real-world applications. Earth System Science is an exceptionally interdisciplinary field requiring knowledge and skills from multiple scientific disciplines. Many important questions lie at the intersection of traditional disciplines and require a systems level approach. The emerging educational challenge is to train the next generation of scientists to address these topics. Here, we describe the development, delivery, and assessment of a new course in Earth System Science designed for advanced undergraduates and beginning graduate students. The course was designed to meet specific learning objectives, delivered in an inquiry-based learning environment, and assessed to determine the extent to which the learning objectives had been attained. The course consisted of readings from both texts and primary literature, lectures by UNH professors and NASA scientists, computer modeling labs, and interdisciplinary student-team research projects. Results emphasize the importance of pre-planning and resources, establishing clear and concise student learning objectives, creating of an inquiry-based learning centered environment, role-modeling how Earth System Science research is done, and meeting student demand and institutional challenges. This class can serve as a model course for upper level undergraduates and beginning graduate students to expand their disciplinary scope, skills, and readiness to address Earth System Science questions. We have developed a curriculum at Howard University that educates and prepares students, especially underrepresented minorities, for careers in Atmospheric, Earth and Space Sciences. One of the main objectives of the current initiative has been to provide introductory Earth & Space Science courses at the undergraduate level through the Department of Physics & Astronomy. These courses enhance student learning by including astronomical observing and laboratory demonstration opportunities at the Howard University Observatory. Intermediate-level courses in Atmospheric and Space Science have also been designed, and will serve as a bridge toward the graduate-level courses currently being offered by the M.S./Ph.D.-granting Howard University Program in Atmospheric Sciences (HUPAS). HUPAS is the first and only program at a Historically Black College or University (HBCU) that offers a terminal graduate degree (M.S. or Ph.D.) in Atmospheric Sciences. Currently, a total of 23 graduate students are enrolled in HUPAS, which include 14 African-Americans and 6 Hispanic-Americans, and 3 international students from Mexico, Barbados and Madagascar; and the gender breakdown is 13 females and 10 males. To the best of our knowledge, this is the largest number of African/Hispanic students enrolled in a graduate atmospheric science program in the U.S.
Earth System Science at the University of Arkansas is a hybrid face-to-face (F2F) and online course for undergraduates. The course serves two distinctly different audiences: Honors College students and pre-service science teachers. Earth System Science was the first course at the University of Arkansas designed to be "all Internet, all the time" - that is, all course content was derived from Internet resources, supplemented by F2F class sessions with hands-on, inquiry-based activities utilizing on-line data repositories to illustrate fundamental aspects of the Earth System. In 2001, the course received financial support from the National Aeronautics and Space Administration Opportunities for Visionary Academics program (NASA NOVA) to enhance utilization of NASA data products and promote systemic change in education of pre-service teachers. In 2004, Earth System Science at the University of Arkansas was named "exemplary" by the NASA NOVA program. 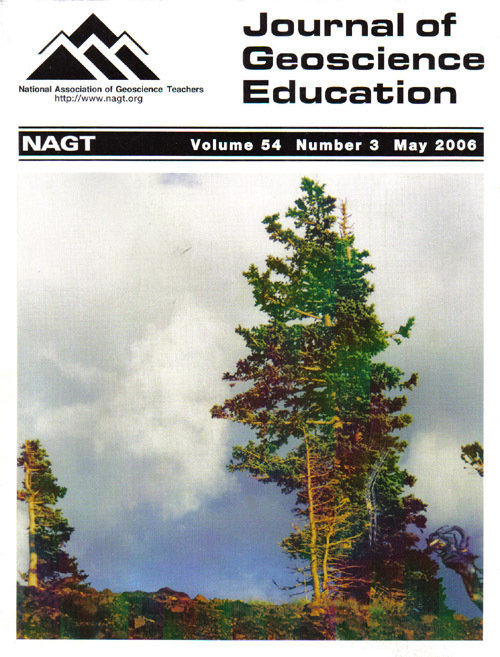 In order to assess the effectiveness of this hybrid course format, changes in conceptions/perceptions and knowledge of science, the Earth System, and pedagogical perspectives were documented for science, non-science, and education majors using pre- and post-test results from three class cohorts (2001, 2002, 2005). Comparisons among these groups provided a number of insights. Conceptions/perceptions and knowledge of science, the Earth System, and pedagogical perspectives determined from analyses of pre-tests were similar among all students, irrespective of academic discipline. Post-test results, however, indicated some perceptual change among all students in line with course objectives. Perceptual changes were most pronounced among non-science majors. Overall changes in measured parameters toward stated course objectives suggests a successful approach to teaching Earth System Science to students with widely varying academic backgrounds. With NSF funding, we have developed, taught, and evaluated a new lower-division science course for non-science majors, entitled "Geology, Resources, and Environment of Latin America" (GRELA). GRELA is intended to attract Hispanic undergraduates to science and to increase awareness among non-Hispanic students about challenges facing our neighbors to the south. GRELA is an interdisciplinary exploration of how the physical and biological environments of Mexico, Central America, and South America have influenced the people who live there. The course consists of 22 lectures in four modules (Background; Minerals; Energy and Natural Hazards, and Water and the Environment). Presentation of ESS topics dominates the last part of the class and includes lectures on El Nino, glaciers, the Amazon, rain forests, and coral reefs; a final set of lectures focuses on challenges facing the US and Mexico over shared water resources. Grades are based on two mid-term exams, a final exam and a report developed in partnership with correspondents in Latin American universities. Evaluations indicate this course positively impacts student interest in science, although some of the favorable comments may result from small class size. We encourage adaptation of our course materials at other community colleges and universities and will share these with other instructors on request. This paper presents an evaluation of the implementation of Earth system science curriculum in a large format introductory course oriented for an urban audience. Similar to most universities, the University of Missouri-Kansas City's Department of Geosciences is located in an urban setting. Supported by NASA's Earth System Science Education Program (ESSE 21), the UMKC team developed and revised course content and teaching strategies by integrating a focus on urban environments as a key curriculum component. In an era of greatly expanding urban landscapes, growing resource pressures, and increasing societal impacts of natural hazards, engaging students in urban issues and the importance of Earth science is critical. Curriculum design is make strong connections to our students' sense of place- the urban environment. The curriculum relates Earth systems to human constructed landscapes. It also provides a range of assessment options maximizing student flexibility. Comparing performance results from the original course to two years of the restructured course demonstrates increases in performance. Curriculum changes in the restructured course are further evaluated through a broad range of assessments at different time scales. Assessments measure student content knowledge, a variety of active learning activities, and student self-efficacy. Finally, the success of impact of curriculum change and methods is evaluated. Student responses are favorable, and performance increases with time-on task activities such as pre-quizzes and weekly assignments. Alternative grading strategies such as in-class topical modules and Academic Service Learning increase student engagement and understanding. Students also demonstrate significant increases in the self-efficacy of their science knowledge. We investigate the merit of including deliberate instruction on argumentation and debate in an undergraduate Earth system science course. We examine sample student evaluations of arguments constructed by their peers during a classroom debate on Earth's climate system. Students participating in this exercise had, at a minimum, a baseline understanding of both global climate change and scientific argumentation. Three weeks of instruction were dedicated to global climate change and included an introduction to scientific argumentation. The objective of this exercise was to obtain a deeper understanding of how students use critical reasoning skills when assessing claims related to the global climate. Under the conditions studied, we found that while students invoked critical reasoning skills when assessing the relative strengths of opposing arguments, they often favored presentation style over content in their overall evaluation of the debate. Our finding suggests students be given ongoing practice in critically evaluating claims related to the global environment. Courseware to teach about the interdisciplinary nature of the Earth system was constructed based on the concept of intersecting spheres, as illustrated by Venn diagrams. This inquiry-driven courseware, which was called the Zen of Venn, was applied in an undergraduate capstone course at The Ohio State University over two years. Results from these applications reveal that individuals integrate between 2 and 3 topics at a time, which appears to be related to the fact that the complexity of integration increases geometrically relative to the number of intersecting spheres. An area for future research would be to test whether integrating 3 plus or minus 1 topics is a generalized cognitive limitation like memorizing "7 plus or minus 2 random items." These data and observations imply that interdisciplinary courses or textbooks with many distinct topics are geared more toward memorizing than synthesizing. Consequently, to facilitate individualized discovery of knowledge (which is gained by establishing relationships between things that are known and unknown), interdisciplinary teaching materials should be designed in a manner that stimulates open-ended inquiry and integration with embedded sets of 4 or less topics. Studies have shown that both students and the general public possess many misconceptions about the processes involved in the greenhouse effect and ozone depletion. This study, conducted in a mock summit class on global climate change, explored the level of understanding and the nature of students' misconceptions about climate. Several times throughout the class, students responded to a set of questions about the greenhouse effect. Through analysis of their responses, we were able to track changes in students' mental models, evaluate the degree to which they were able to overcome misconceptions, and assess the permanence of the newly achieved understanding. Based on these results, we comment on the potential role of these students in public decision making related to global climate change, and discuss ways in which misconceptions could impede sound judgment on issues related to climate policy. Based on previous experiences with both teaching and assessing student learning about global climate change, we propose key principles that we consider minimum knowledge for an undergraduate student in Earth Science. We suggest that Earth science educators should focus on identification of key principles in all areas of the discipline and use those as the basis for curriculum development. Students organize scientific knowledge and reason about issues in the Earth sciences by manipulating internally-constructed mental models and sociallyconstructed, expressed, conceptual models. The Earth sciences, which focus on the study of complex, dynamic, Earth systems, may present unique cognitive difficulties to students in their development of authentic, accurate expressed conceptual models of these systems. This pilot study came about as we were seeking to construct inquiry modules to assist undergraduate students as they developed an understanding of eutrophication along the coastal margin, a good example of a complex, dynamic, environmental process. The modules we developed coupled the use of physical models and information technology (IT)-based multiple representations with an inquiry-based learning environment that allowed our students to develop and test their conceptual models based on available evidence and to solve authentic, complex, and ill-constrained problems. Our hypothesis was that the quality of students' conceptual models would predict their performance on inquiry modules, and that students' prior knowledge (measured by number of previous courses in geology) would mediate the strength of the relationship between students' model expression and their inquiry performance. Statistical results of this study indicated such a relationship existed only among students in the high prior knowledge group. In the light of our findings, we make recommendations for pedagogical accommodations to improve all undergraduates' abilities to understand complex, dynamic, environmental systems, with a particular emphasis on students who have lower levels of prior knowledge. Student ontological level is an important consideration for faculty interested in teaching Earth System Science. Interviews with 61 students enrolled in entry-level geology courses at two institutions reveal that very few students exhibit Process or Systems ontologies. Earth Systems Science instruction generally assumes that students are thinking about processes and systems, although this study suggests that students predominantly understand that changes occur on Earth without either 1) a concrete acceptance that these changes result from a cause, or 2) an explanation for these causes beyond scientific terms such as "subduction". This has critical implications for teaching Earth System Science, and suggests that activities that can help college students develop Process and Systems ontologies need to be developed and evaluated. Despite robust rationales for using an inquiry-based pedagogy in university and college-level science courses, it is conspicuously absent from many of today's classrooms. Inquiry-based learning is crucial for developing critical-thinking skills, honing scientific problem solving ability, and developing scientific content knowledge. Inquiry-based pedagogy provides students with opportunities to participate and practice the activities involved in science. There are a number of dimensions that are integral to the creation of an inquiry-based learning environment that are applicable to the geological sciences. We considered these dimensions in the design of an inquiry-based undergraduate geology course and collected quantitative and qualitative data that documents the successful implementation of this redesigned course. Our findings show that when appropriately structured, inquiry-based learning can help students develop critical scientific-inquiry skills, suggesting that inquiry-based learning is essential for teaching geology at the university or college level. With the proper alignment of course objectives, content, pedagogical design, tasks, assessment strategies, and instructor and student roles, geoscience instructors at the university or college level can create inquiry-based learning environments in which students are able to successfully develop skills in scientific inquiry as well as geological content knowledge. Research and education about the Earth and environment can be considered as a cascade of information flows, from the Earth, into sensors, then to data, then to insights in the minds of scientists, curriculum materials, teachers, and finally to insights in the minds of learners. In at least some cases, the insights in the minds of learners feed back to the Earth as learners send a message to the Earth in the form of modifications to their actions and decisions. This paper asks: To what extent does, or should, science education seek to change how individual human beings and human society interact with the Earth and environment? We explore this question by examining the outcomes of 49 separate deliberative processes, the state science education standards. We find that there is serious disagreement across the nation as to whether science classes should consider human/environment interactions at all. There is more support for teaching about how human society impacts the environment than for teaching about how the environment impacts humans and human society. In most states, there is minimal or no support, in the standards, for teaching about how individuals can and do impact the environment.